Was the Divinely-inspired text within the Bible meant to be read literally or spiritually? Yes, there are two passionately-defended schools of thought. From our viewpoint, the Bible is full of symbolism and spiritual meaning just waiting to be revealed. You may not agree, but give us a chance to explain and you may see a new message arise from the Old Testament story of Noah’s Ark and the Flood. 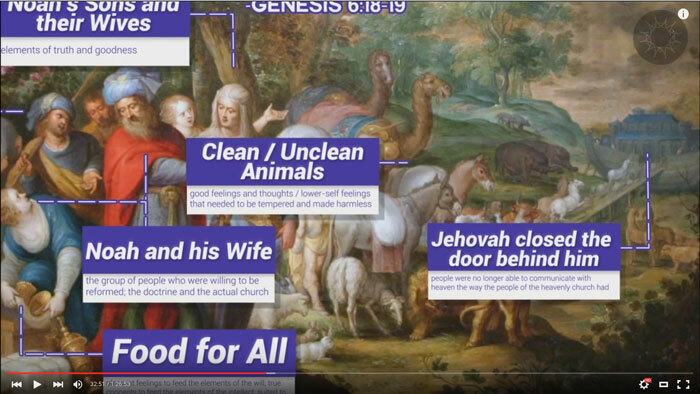 In this episode of Swedenborg and Life, host Curtis Childs and featured guests take us from the literal story about God destroying all of creation with a flood to a story about God’s still-ongoing efforts to provide us with an ark, thereby saving us from self-destruction. Coincidentally (or not-so-coincidentally), many cultures and faith traditions have parables that closely echo the Book of Genesis flood narrative. Professor of history Dr. Wendy Closterman joins the conversation to provide an overview of one such ancient parable. Dr. Closterman feels that the shared theme among these flood parables is a renewal of humanity and that it is just put into different contexts. These large collections of flood stories throughout the world just go to show that this concept is relevant to all humanity and not just those who believe in the Bible. 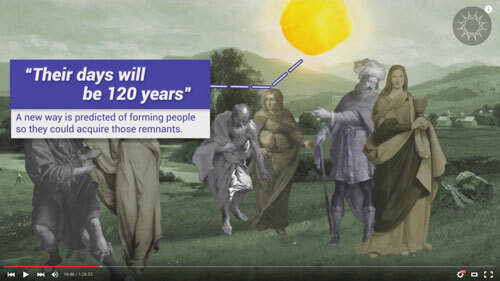 To set the stage for our exploration of the Noah and the Flood parable in the Book of Genesis, Curtis introduces us to this idea of “remnants”—a spiritual term Swedenborg used to describe the states of goodness and truths saved up in our hearts over time. These spiritual memories get us through both the good and bad times experienced in the physical world. Curtis contends that the common flood parables that have existed throughout history are all about how the spiritual remnants of humanity were almost destroyed by evil. 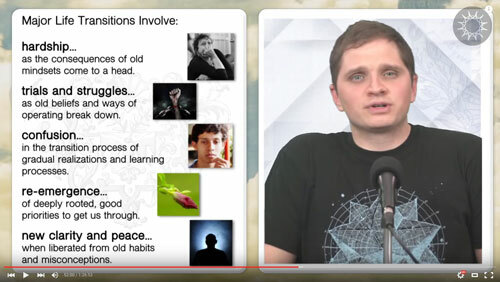 Through his spiritual explorations, Swedenborg believed Bible stories to have what he called an internal sense—with multiple layers of historical, psychological, spiritual, and personal meaning. To start with the historical sense, Curtis takes us back to the time of Noah when early humans lived in idyllic states of happiness and peace as described in Genesis 6:1–3. Curtis goes on to break down the symbolic inner layer of meaning contained within the text, describing how each of the characters represented the evil and corrupt mindsets that were starting to take hold of the human race at the time. 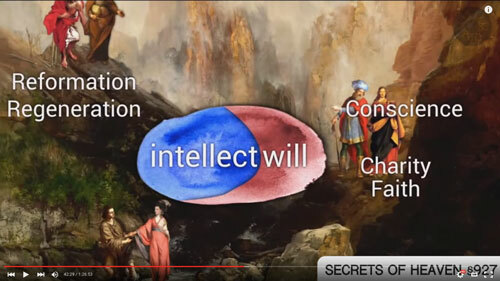 Swedenborg pinpoints this as symbolic of the time in history when God stepped in to separate thoughts and feelings so that humans could use logic and reasoning to choose between good and evil. In Genesis 6:6–8, it’s mentioned that God regretted what he created because of humanity’s corrupt tendencies; but Swedenborg says that this regret is symbolic of his mercy, which he explains in Secrets of Heaven §587. 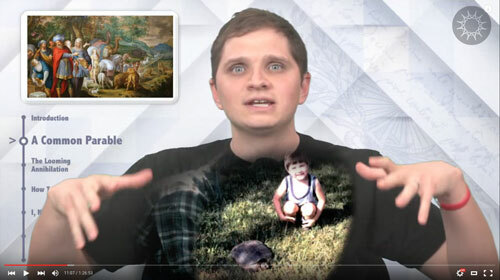 Curtis goes on to explain that Swedenborg does not believe the flood described in Genesis to be an act of God vengefully wiping out humanity; rather, Swedenborg saw the flood as a symbol of humanity’s evil cravings taking over the planet. God’s plan to save us from ourselves is characterized by a man named Noah. To save us (Noah) from the flood of evil, God had to teach us how to float through troubled waters. What was once a planet of heavenly consciousness and peace had become flooded with corruption and evil. To counteract evil and restore spiritual remnants in the hearts of humans, God invited us (Noah) to join him in a new way of life that separated thoughts and feelings so we can float above the waves of corruption and choose good over evil. 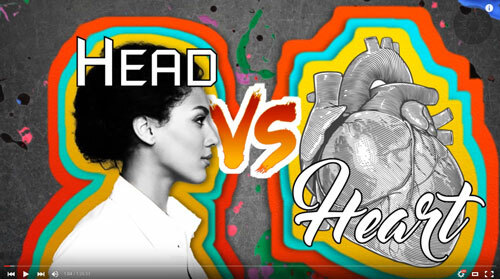 Swedenborg’s philosophy about the separation of thoughts and feelings—or what he called will and intellect—that occurred after the flood is summed up in this narrated excerpt from Secrets of Heaven §927. As mentioned earlier in the episode, there are many ancient parables about floods that exist throughout many cultures and faith traditions. 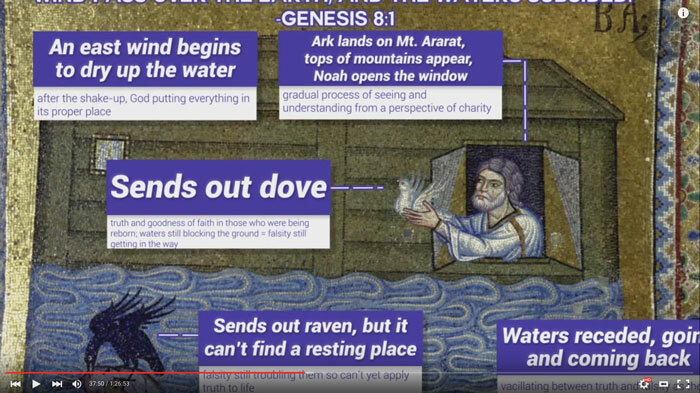 Swedenborg pointed out the spiritual and psychological meaning of the Bible’s flood story, but he wasn’t the only one to see such parallels. Our guest Dylan Odhner, a doctoral candidate in mythology and psychology, joins the conversation to talk about some of these universal flood stories and the seemingly infinite variety and number of consistencies between them. He feels that flood lesson stories are seen as punishment when taken literally; but when looked at through a spiritual lens, the stories actually represent the birth of consciousness. Yes, the Noah parable speaks to humanity’s salvation through consciousness; but it also speaks to our own troubles, or floods, on a personal level. 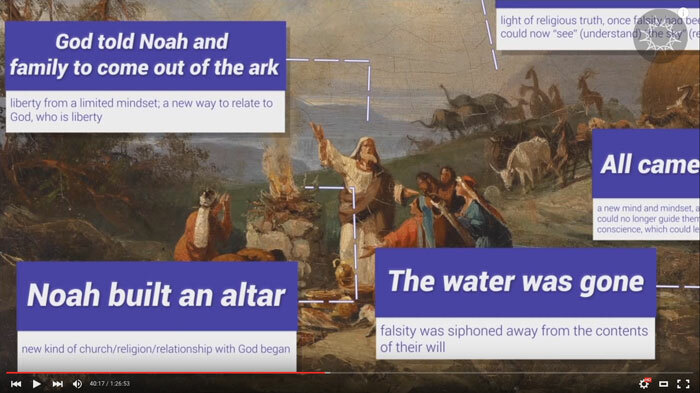 At this point in the episode, Curtis takes viewers through each element of the Noah and the Flood story and offers a series of excerpts from Swedenborg’s writings that explain how the Bible story relates to our personal lives. If Swedenborg is right, our struggles have the potential to free us from evil and negativity and restore goodness and truth. While challenging, struggles are a necessary part of life because they guide us through the process of spiritual regeneration. After the characters in the flood story in Genesis had survived the storm, God told them to go out and reproduce and multiply on the earth. Swedenborg says this represents how we’re all called to spread the good thoughts and feelings that arise within us after the evil and negative things that have touched our lives are wiped out. Think about your happiest times and the thoughts and feelings you had during those experiences. Imagine them growing and multiplying forever. 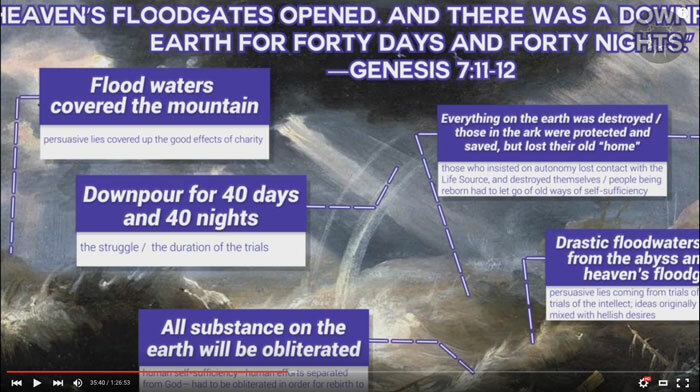 That’s the promise of the flood narrative in the Old Testament and the ideal picture Swedenborg has of the human mindset as it extends from life on earth into the next life in heaven. Why did God need to speak in a complicated, indirect way? 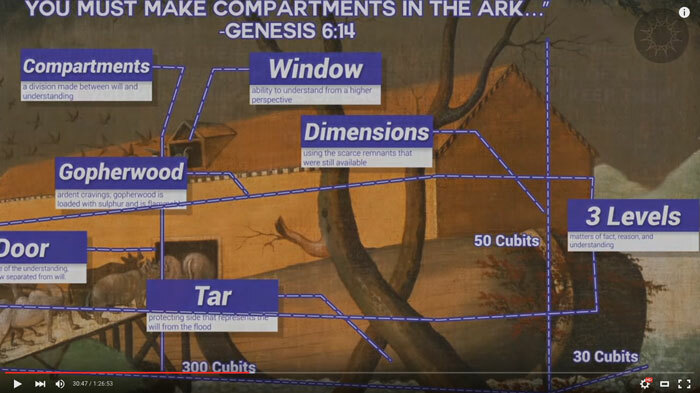 How will people learn the Bible with all this symbolism if the Bible is not what it really means? The Bible seems too abstract for anyone to really understand. So no matter how bad/evil you are, you will always have a good remnant? Even in those wicked times before the flood? One of Noah’s sons was cursed. Why and what was Swedenborg’s take? What about the giants after the flood?